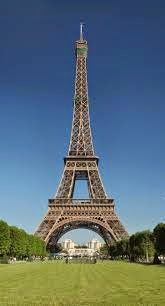 The Eiffel Tower in Paris, France was constructed as the entrance gate to the 1889 World's Fair. Built by Gustave Eiffel, this Iron Lady stands 1063 feet above the city and has become one of the most famous landmarks in the world. However, it almost ended up in the scrap pile. Built as a temporary structure for the fair, plans were made to tear the tower down, but in 1909 a group of citizens realized its importance as a radiotelegraph tower and convinced the city to keep it. The Iron Lady went on to play a key role in communications during the First World War. Today, over 700 million people visit the tower annually to sightsee and dine in the on-site restaurant. Unfortunately, some come for a different reason. To date, approximately 400 people have committed suicide at the Eiffel Tower. Behind poisoning and hanging, jumping off the iconic landmark is the third most popular way to off yourself in France. The first suicide on record, however, actually WAS a hanging. A 23 year old man hanged himself from one of the beams on July 15th, 1898. There have also been some rather strange accidents, including the death of Franz Reichelt, who on February 4th, 1912 stepped off the tower wearing a strange, homemade parachute. The chute obviously failed and the stunt was captured on film. Since the 1960s, added safety measures have been implemented in an effort to curb the appeal of suicides. Modern security fences, cameras, and safety netting have drastically lowered the suicide rate, but an occasional determined soul still slips through, including a young female student in 2009 and a British man in 2012. With the reputation of being one of the most appealing suicide spots in all of Europe, if not the world, its no wonder that the Eiffel Tower has picked up a reputation for being haunted. However, the ghost of the Eiffel Tower has nothing to do with suicide! As legend goes, a young couple met one evening at their favorite romantic spot atop the tower. The gentleman had come to propose---the young lady had come to end the relationship. Enraged at being dumped, the man either pushed or threw the young woman off the side of the tower to her death. To this day, visitors to the spot can hear the girl giggling, then the giggling turning to an argumentative plea, then finally to screams as her grisly death is trapped in time to repeat itself over and over.